Infiniti is planning to soon unveil the first variable compression engine in the world when it debuts the next-generation Infiniti QX50 crossover. The vehicle will have as its powerplant a 2.0-liter turbocharged four-cylinder engine that unlike other petrol powered cars will use a new technology that has never been used in production vehicles: variable compression. Nissan has been working on the Variable Compression – Turbo (VC-T) engine for the past 20 years. Put simply, the engine has a device that changes the distance the pistons travel in their cylinders by as much as 6 mm, or about a quarter of an inch. This can have a significant effect on the power and efficiency of the engine. Shinichi Kiga, Nissan’s chief powertrain engineer, said that as an outcome of using Infiniti’s VC-T engine, the new Infiniti QX50 will have a combined city-highway EPA-rated fuel economy gain of 27 percent over the 3.7-liter V-6 that was used earlier. The 2019 QX50 will also reach 60 mph almost one second faster than its four-cylinder competitors. Currently, the pistons in all automotive internal combustion engines travel the same distance up and down in the cylinder, irrespective of the vehicle’s speed and vehicle load. The pistons are linked to rods that are mounted to the crankshaft. The engine has a fixed compression ratio is fixed that depends on the amount of space above the pistons when they move to the top during the combustion cycle. The smaller the space above the pistons, the higher is the compression ratio and more is the power produced by the engine. Infiniti has changed the layout of the engine and this is the first such change that has been made in a century. 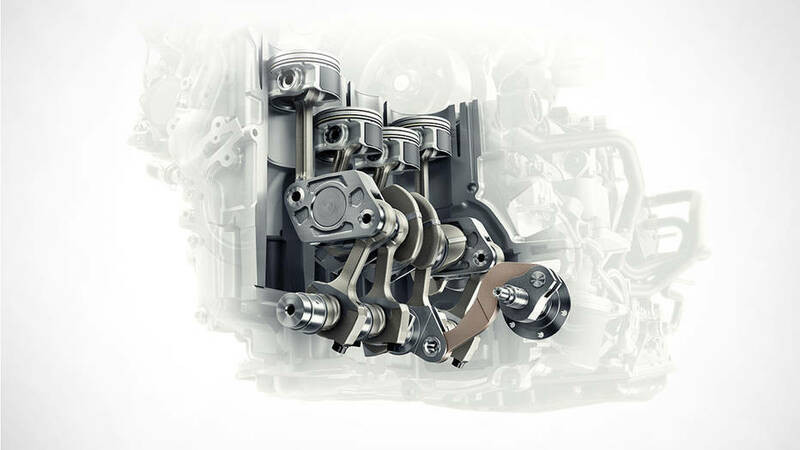 In Infiniti’s new VC-T engine, the pistons are connected to rods which are attached to one end of an elliptic device called a multilink. It is this multilink that is mounted on the crankshaft instead of the connecting rods as in a conventional engine. At the other end, the multilink has a short rod which is connected to a shaft. An electrically controlled actuator is in place to twist the shaft, and this causes the multilink to tilt up or down slightly. When the end of the multilink that is closest to the piston is tilted up, the piston moves to the top of the cylinder. This is the high-compression mode, 14.1.When the multilink moves further down, the piston’s travel in the cylinder stops before it reaches the top and this changes the compression ratio to 8.1. However, the the turbocharger comes into action then and increases the output of the engine. The turbocharger increases the pressure in each cylinder with a denser mixture of fuel and air, that increases power. In addition to the turbocharger, the VC-T has both port and direct fuel injection, variable valve timing and a cooling system with four circuits. All of these systems provide inputs to the engine’s computer, which runs a fast-spinning electric motor that operates the actuator arm that changes the piston travel. While the VC-T is 10 per cent more expensive than a conventional regular 2.0-liter turbo four-cylinder engine, it is still cheaper than a diesel engine. The engine also produces less friction though it has more moving parts than other turbocharged, four-cylinder engines. This is due to the fact that the piston travels straight up and down in the cylinder, thus eliminating side forces that cause friction. One downside is that the engine calls for the use of premium gasoline, which is more expensive than regular gasoline.